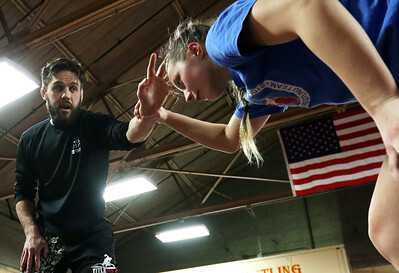 Matthew Apgar - mapgar@shawmedia.com Jon Murphy of Crystal Lake goes over a move with Madison Peet of Sycamore, 15, at Old School Wrestling Training Center on Wednesday, March 21, 2018 in Huntley. Matthew Apgar - mapgar@shawmedia.com Vance Williams of Hampshire (left), 11, and Brayden Peet of Sycamore, 14, practice wrestling techniques at Old School Wrestling Training Center on Wednesday, March 21, 2018 in Huntley. 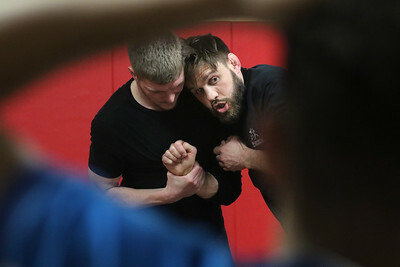 Matthew Apgar - mapgar@shawmedia.com Gabriel Eaton of Woodstock, 16, looks up at wrestling instructor Jon Murphy of Cystal Lake as they demonstrate wrestling technique at Old School Wrestling Training Center on Wednesday, March 21, 2018 in Huntley. 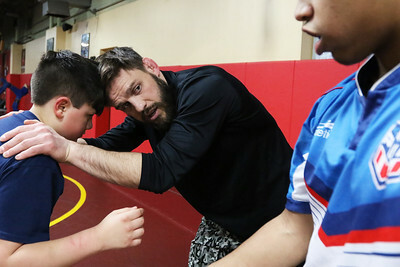 Matthew Apgar - mapgar@shawmedia.com Instructor Jon Murphy of Crystal Lake goes over wrestling technique with Gabriel Eaton of Woodstock, 16, at Old School Wrestling Training Center on Wednesday, March 21, 2018 in Huntley. 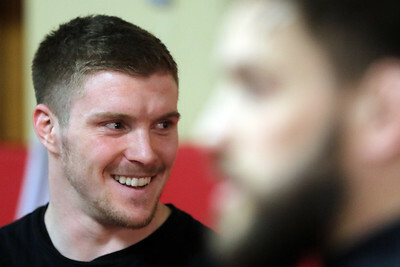 Matthew Apgar - mapgar@shawmedia.com Vance Williams of Hampshire, 11, watches as wrestling instructors Trevor Jauch (top) and Jon Murphy (right) go over moves at Old School Wrestling Training Center on Wednesday, March 21, 2018 in Huntley. Murphy, a former wrestling coach at Johnsburg and Crystal Lake Central, coached Jauch to three state championships for Crystal Lake Central. Matthew Apgar - mapgar@shawmedia.com Gabriel Eaton of Woodstock, 16, holds his hands atop his head as he watches wrestling instructors Trevor Jauch (left) and Jon Murphy, both of Crystal Lake, demonstrate a move at Old School Wrestling Training Center on Wednesday, March 21, 2018 in Huntley. Murphy, a former wrestling coach at Johnsburg and Crystal Lake Central, coached Jauch to three state championships for Crystal Lake Central. 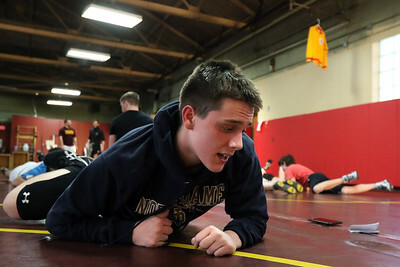 Matthew Apgar - mapgar@shawmedia.com Julian Ryerson of Crystal Lake, 15, crawls on the wrestling mat with other students as they warm up for class at Old School Wrestling Training Center on Wednesday, March 21, 2018 in Huntley. Matthew Apgar - mapgar@shawmedia.com Trevor Jauch of Crystal Lake demonstrates a stretch for Julian Ryerson of Crystal Lake, 15, and other wrestling students at Old School Wrestling Training Center on Wednesday, March 21, 2018 in Huntley. Jauch, a 2011 Crystal Lake Central graduate, was a three time state champion for the Tigers. Matthew Apgar - mapgar@shawmedia.com Jon Murphy (left) and Joey Kielbasa, both of Crystal Lake, watch as students warm up for class at Old School Wrestling Training Center on Wednesday, March 21, 2018 in Huntley. 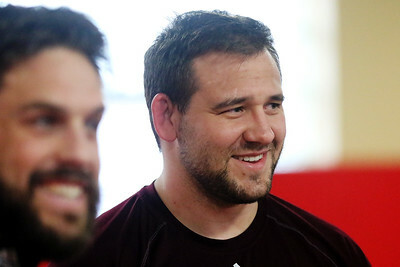 Murphy, a former wrestling coach at Johnsburg and Crystal Lake Central, coached Kielbasa to three state championships for Crystal Lake Central. 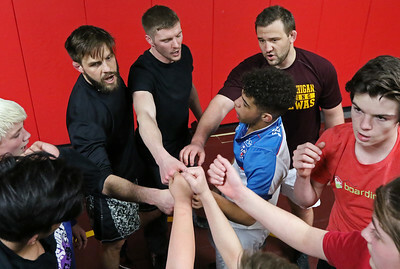 Matthew Apgar - mapgar@shawmedia.com Wrestling students huddle around instructors Jon Murphy (back left), Trevor Jauch (center) and Joey Kielbasa, all of Crystal Lake, at Old School Wrestling Training Center on Wednesday, March 21, 2018 in Huntley. 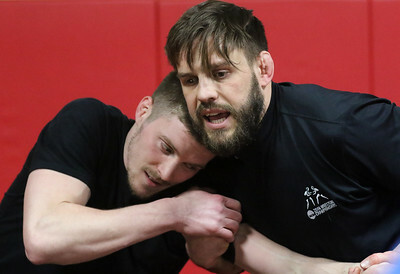 Murphy, a former wrestling coach at Johnsburg and Crystal Lake Central, coached Jauch and Kielbasa to three state championships each for Crystal Lake Central, where they graduated in 2011. Matthew Apgar - mapgar@shawmedia.com Brayden Peet of Sycamore, 14, watches as wrestling instructors Jon Murphy (left) and Trevor Jauch demonstrate moves at Old School Wrestling Training Center on Wednesday, March 21, 2018 in Huntley. Murphy, a former wrestling coach at Johnsburg and Crystal Lake Central, coached Jauch to three state championships for Crystal Lake Central. Matthew Apgar - mapgar@shawmedia.com Wrestling instructor Jon Murphy demonstrates a move for students with Gabriel Eaton of Woodstock, 16, at Old School Wrestling Training Center on Wednesday, March 21, 2018 in Huntley. Matthew Apgar - mapgar@shawmedia.com Vance Williams of Hampshire, 11, rests his hands atop his head during a break at Old School Wrestling Training Center on Wednesday, March 21, 2018 in Huntley. 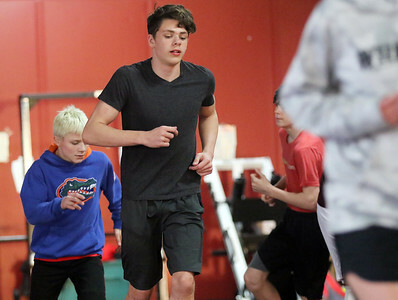 Matthew Apgar - mapgar@shawmedia.com Julian Ryerson of Crystal Lake, 15, runs laps around the mat with other wrestling students at Old School Wrestling Training Center on Wednesday, March 21, 2018 in Huntley. 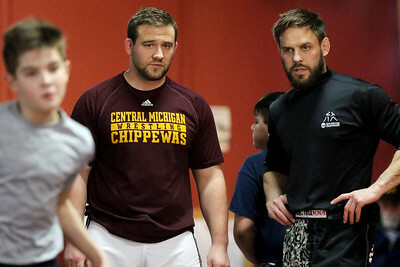 Matthew Apgar - mapgar@shawmedia.com Wrestling instructors Trevor Jauch (left) and Jon Murphy watch as students warm up at Old School Wrestling Training Center on Wednesday, March 21, 2018 in Huntley. Murphy, a former wrestling coach at Johnsburg and Crystal Lake Central, coached Jauch to three state championships for Crystal Lake Central. Matthew Apgar - mapgar@shawmedia.com Xander Gramarossa of Gilberts, 14, crawls on the wrestling mats as students warm up at Old School Wrestling Training Center on Wednesday, March 21, 2018 in Huntley. Matthew Apgar - mapgar@shawmedia.com Jon Murphy of Crystal Lake demonstrates a move with Teigen Moreno of Algonquin (left), 10, and Gabriel Eaton of Woodstock, 16, at Old School Wrestling Training Center on Wednesday, March 21, 2018 in Huntley. Matthew Apgar - mapgar@shawmedia.com Wrestling instructors Joey Kielbasa (center) and Jon Murphy watch as students run laps around the mats at Old School Wrestling Training Center on Wednesday, March 21, 2018 in Huntley. 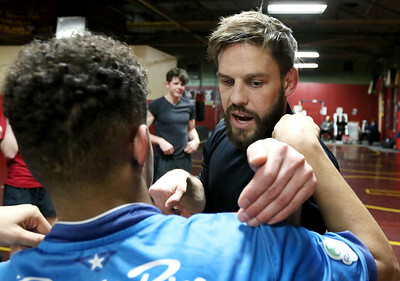 Murphy, a former wrestling coach at Johnsburg and Crystal Lake Central, coached Kielbasa to three state championships for Crystal Lake Central. Matthew Apgar - mapgar@shawmedia.com Students hit the mats with sprawling drills at Old School Wrestling Training Center on Wednesday, March 21, 2018 in Huntley. 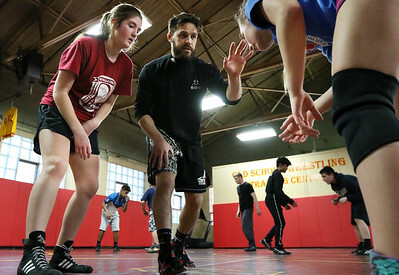 Jon Murphy goes over wrestling technique with Vallorie Williams of Hampshire (left), 13, and Madison Peet of Sycamore, 15, at Old School Wrestling Training Center on Wednesday, March 21, 2018 in Huntley.